Yes, the zombie zeitgeist is in full swing. How can I tell? Well, these kind of quick-and-dirty cash-ins are a good hint. One of my zombie buddies sent me this link a few days ago. 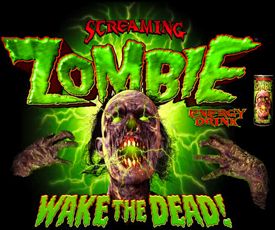 Mmm… Screaming Zombie energy drink, just the thing to wake you from a dead slumber and get you started on your day. Based on the website, it looks like this guy is just repackaging some generic energy drink under horror labeling. 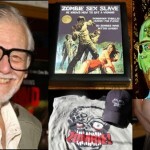 He offers both this zombie brand and your own “custom” energy drink (custom label, anyway). Now, I’m somewhat of an energy drink fiend and I have to admit, although I am sure this is swill, I would totally buy a can of it if I saw it in the store — I am compulsive that way. And who knows, maybe I am wrong. Maybe this is made of the highest quality zombie ingredients and three days after you drink it, you die and then come back from the grave. We can hope, anyway. I’ve offered to test and review the stuff. Hopefully the guy will take me up on it.